When the shiny black pearls burst in my mouth as I pressed them onto my palate, I could taste their addictive salty, buttery flavour. It was then that I knew I was hooked on caviar. Not unlike truffles, oysters and champagne, caviar goes hand in hand with all things luxurious. Ancient Greeks, Romans and Russian tsars lusted after these buttery black pearls, considered one of history’s oldest delicacies. And, I can attest, once you fall under caviar’s spell, there’s no turning back. More importantly, why would you want to? Sturgeon ceviche with balsamic pearls topped with caramelized shallots, one of many tasty dishes guests can enjoy during their Sturgeon Safari trip at Acadian Sturgeon and Caviar, Inc. Photo: Brigitte Hasbron. The day I tasted the delicate treat at Ottawa’s posh Restaurant e18hteen, I started an Acadian caviar journey. Executive Chef Dave Godsoe had just launched his new seasonal menu, so I was introduced to the delicious roe from Acadian Sturgeon and Caviar, Inc. One small sample of this delectable product stirred my ‘all or nothing’ attitude, and the next thing I knew, I was proposing a road trip of sorts to see how these savoury black pearls are harvested from sturgeons. Seven months later I was in a boat with Chef Dave on the Saint John River in New Brunswick, trying to catch these fish. All the while we were learning as much as we could from an incredible and very passionate biologist named Cornel Ceapa. And, just like that, my Sturgeon Safari commenced. Originally from Romania, Cornel has a Ph.D. in sturgeon biology and he has dedicated a greater part of his life to these prehistoric-looking fish. Along with his wife Dorina and son Michael, he has transformed the caviar trade by running a unique and sustainable aquaculture business, Acadian Sturgeon and Caviar, Inc.
A luxurious morning treat of sturgeon ceviche with balsamic pearls accompanied by some Champagne during my Sturgeon Safari trip at Acadian Sturgeon and Caviar Inc. Photo: Brigitte Hasbron. History has shown that overfishing of the different sturgeon species, including the well-known Ossetra, Sevruga and Beluga, has led to steep prices and an increase in demand for the unfertilized salt-cured fish eggs. Ironically, this prized commodity was once considered peasant food, much like another celebrated bottom feeder: the lobster. With more knowledge about the minutiae of harvesting the tasty eggs, the negative perception was reversed. Eventually, demand for caviar grew so much that it nearly caused the complete extinction of wild sturgeon populations. Extinction is the opposite of Cornel’s goal for his sustainable company, based in Carters Point, New Brunswick. For me, taking part in the Sturgeon Safari was really something else. Never would I have thought I would be waking up at the crack of dawn to get suited up in fishing attire to search for sturgeons. It was incredible to see these fish up close and marvel at their shark-like characteristics: long torsos accentuated by armour-like skin. It’s a wonder that something so amazingly delicious comes from these docile, primitive creatures. Watching Cornel talk about sturgeons with his fishermen, it was easy to feel their enthusiasm as we all held our breath when the nets were pulled up, hoping for a mature female catch. 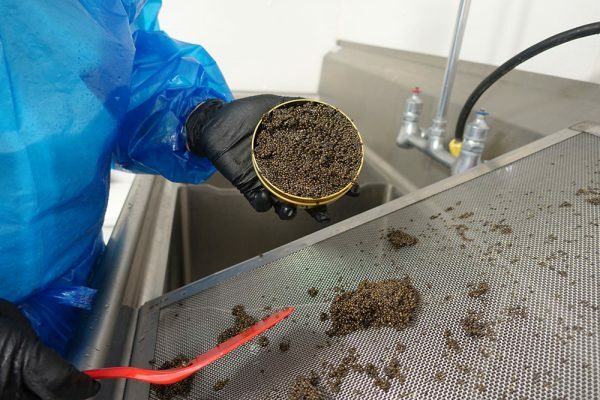 Over the course of several days, I was privileged to see the intricate workings behind how caviar comes to be. Surprisingly, the experience wasn’t all about the tasty black pearls, as there was much more to it than that. I discovered that in Eastern Canada, due to sustainable fishing practices, the sturgeon population is increasing. That’s unlike other parts of the world, where sturgeon is on the critically endangered species list. This demonstrates that, with a strict management system combined with scientific quotas as well as committed industry partners, sustainability can and will have a global ripple effect. In fact, countries from around the world have taken notice of Acadian Sturgeon and Caviar, Inc.’s practices. For its part, the company is helping to promote the culturing of sturgeon species in sustainable aquaculture operations internationally, by restocking sturgeons in rivers where Atlantic sturgeon used to be native. It’s also leading the way in exporting fertilized eggs and larvae, and is collaborating with research institutes and sturgeon associations for sturgeon rehabilitation in Europe. Along with spending time on the boat while fishermen collected scientific data from each specimen caught, I also visited the Acadian sturgeon hatchery. It takes about 10 years for a sturgeon female to grow big enough to yield eggs for high-quality caviar and to provide sturgeon meat. At the plant, when it was time to extract the black pearls and section the precious sturgeon meat, I donned hygienic attire to avoid cross contamination when entering the processing rooms. It was amazing to see the red meat with its distinctive bright orange marbling being sectioned by Michael (Cornel’s son) so that it could be vacuum-sealed and blast-frozen. Remarkably, almost every part of the fish is used and sold, including the meat, caviar, by-products and skin. 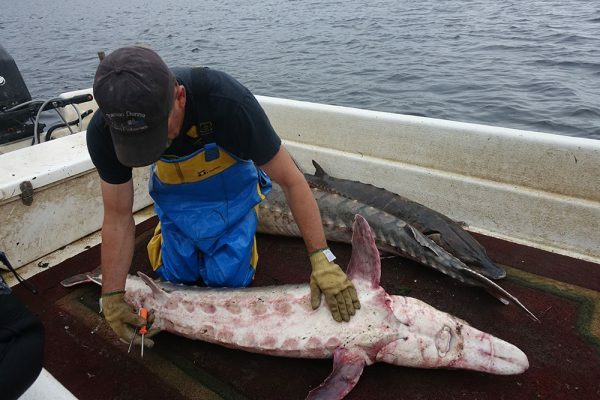 Getting up close and personal with sturgeons: Local fishermen along with Cornel Ceapa, owner and operator of Acadian Sturgeon and Caviar Inc. take vital statistical information from their sturgeon catch, which includes measuring and tagging. Approximately 30% of their total sturgeon catch are released back into the river for a stock assessment study and maximizing the use of this renewable resource. Photo: Brigitte Hasbron. At last, the focus was on caviar. Acadian Sturgeon and Caviar, Inc. has three unique caviar offerings: the Acadian Wild, the Acadian Green and the Acadian Gold. Each has its own exceptional flavour profile; I really enjoyed the Acadian Green for its buttery, nutty sea-salt taste. All the magic happened in a processing room I’ve labelled The Pearl Room. Once the caviar was extracted, Dorina weighed the prized pearls, made caviar brine by adding salt to the eggs, and massaged the mixture for an hour; then it was off to packaging. From river to shipment, the process takes less than two hours; now that’s fresh. During my Sturgeon Safari, I ate a lot of caviar. We are talking about breakfast, lunch and dinner. Picture toasts with crème fraîche and a thick layer of caviar: pure caviar bliss. Both Chef Dave and I enjoyed the warmest hospitality, accompanied by delicious sturgeon and caviar-rich dishes mixed with new experiences along the picturesque Saint John River. Cornel taught me that the traditional way of enjoying caviar is to place a generous dollop on the back of your hand, between the index finger and the thumb, and give it a taste. This allows you to enjoy the appearance of these tasty pearls, the round perfection of the eggs, while appreciating the colour and sheen of the product. To be honest; it was a lot of fun tasting it this way. For those who would prefer the non-traditional method of tasting, it is recommended that you avoid using metal spoons or bowls; caviar will react to metal, giving it a metallic taste. Instead, use servers and utensils made from glass, bone or wood. 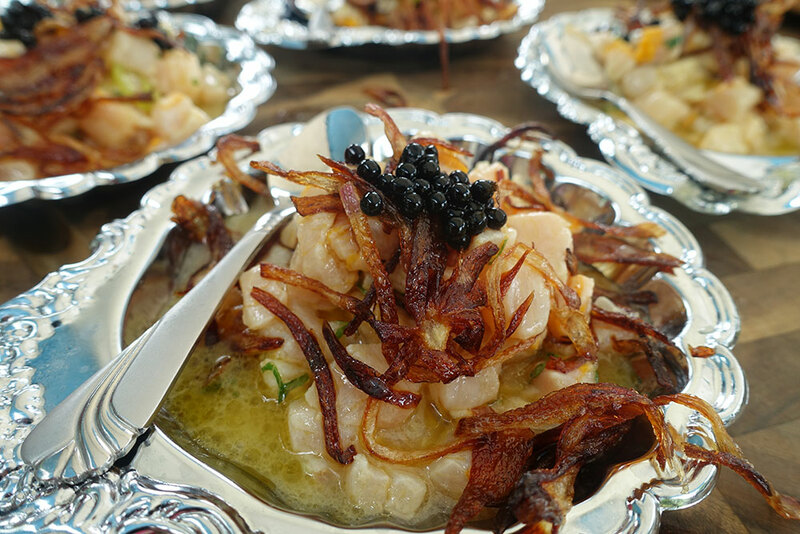 Purists argue mother of pearl is the best way to serve high-quality caviar. Caviar being packaged for a lucky customer at Acadian Sturgeon and Caviar Inc. Photo: Brigitte Hasbron. 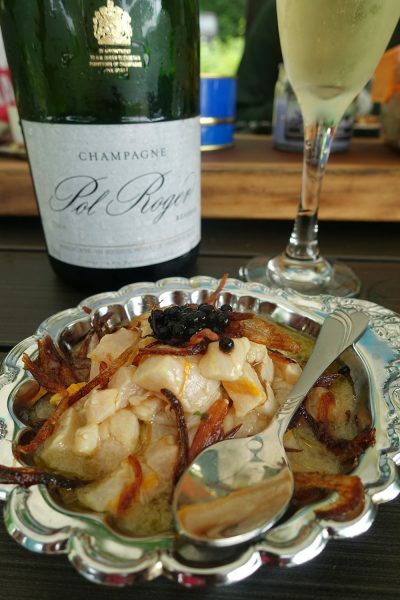 The ultimate way to enjoy caviar is to marry it with your favourite champagne. And the perfect recipe for any caviar indulgence is to follow these four simple steps: Champagne, caviar, champagne, caviar, and repeat. Cornel’s vision and passion for his company have taken him around the world, from collaborating with renowned chefs and culinary institutes to educating budding chefs about his offerings. Chefs are not only using his exceptional products, they are also getting the word out that Canada is providing the world with superior caviar and sturgeon meat. As Robin Leach used to say, “May you have champagne wishes and caviar dreams,” but in this case, let them be Acadian caviar dreams.